Soldering Irons SSE Main web site DUC Radio online e-mail Please include a telephone number. The SSE AB-PRO1 28A is a professionally designed VHF air band antenna which has been 'optimised' for 118-138MHz. The AB-PRO128A presents excellent results when used with hand held pocket scanners, etc. The AB-PRO1 28A may be used with commercial hand held VHF air band transceivers. The SSE EB-608 is a professionally designed "UPGRADE" replacement antenna for UHF TRANSCEIVERS and HAND HELD POCKET SCANNERS. The EB-608 incorporates a state of the art matching circuit using 'PCB' technology. The BNC plug uses 'TEFLON' insulation with the centre pin silver plated. The main TWO frequency bands are at UHF - i.e. approximately 350-500MHz and the cellular bands around 800-970MHz. Hear the difference especially on the cellular bands. Both the SSE FA9O1 -GEN and the FA9O1 -2M are highly flexible portable antennas. The FA9O1-GEN may be used with pocket scanner receivers, etc., in the range 25-1000MHz and is highly effective on the VHF air band 118-138MHz. 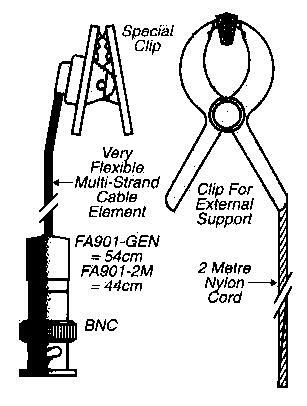 The FA9O1-2M may be used in the range 140-160MHz. The radiating element is made from special multi-strand copper wire covered by synthetic rubber. An unusual plastic ABS revolving clip is connected at the end of the element (Fig. 2) which may be used to grip a shirt, lapel, jumper, jacket, etc., which is ideal for covert use, etc! If you wish to use the antenna from a fixed location a plastic clip with 2m of nylon cord is supplied (Fig. 3). The SSE WA-1001-10 is a professional UHF antenna for TX and RX in the 418-470MHz band (VSWR <2). The SSE WA-1001-900 covers the 770- 900MHz band (VSWR <2). The radiating element whip is made from high quality 2mm diameter stainless steel rod. The SSE special design allows the whip to be used in TWO positions (Fig. 1) vertical or horizontal. Ideal for test equipment, radios, etc. The SSE EB-602 is a high quality and very efficient Helical antenna designed for use with VHF TRANSCEIVERS and HAND HELD POCKET SCANNERS. The main transmit frequency band is approximately 140-155MHz. The EB-602 may be used also as a replacement pocket scanner receiver antenna covering approximately 25-1500MHz.